Mark your calendar for Thursday, August 14th at 6:30PM. 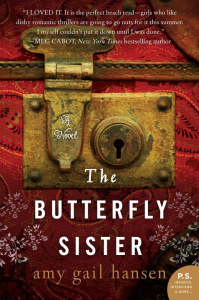 Author Amy Gail Hansen will speak about her novel “The Butterfly Sister,” which is set at a fictional college inspired by Kenosha’s Carthage College. The event will be in room 170 of the Hedburg Library at Carthage College. View the event information on facebook.